Fantasy Flight Games is proud to announce Dear Boss, an expansion for Letters from Whitechapel! You’ve already experienced the battle of wits between the policemen and Jack the Ripper in the cat-and-mouse struggles of Letters from Whitechapel. Now, you’ll gain a host of new variants for the game with the Dear Boss expansion! Within this expansion, you’ll find three modular decks to aid the policemen or Jack, alongside rules for tweaking the balance of the game until it’s perfect, no matter which side your group favors. 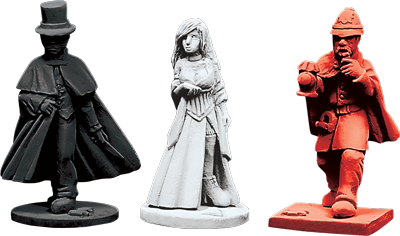 Twelve beautifully sculpted plastic miniatures invite you to replace the Policemen, Jack, and Wretched pawns from the base game and a new Jack screen implements this expansion's variants. Finally, every inch of Dear Boss is overflowing with historical detail, giving you even more insight into the lives of the men and women who played out this tragedy in 1888. 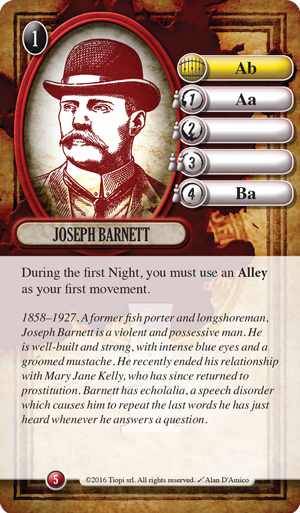 If you’ve already played Letters from Whitechapel, you know that the base game offers a wealth of variants that allow you to alter the balance of your game, based on whether Jack or the police are winning more often. With the Dear Boss expansion, you’ll find three new variants alongside a guide on exactly how to introduce these variants to your game for the first time. Three new modular decks make their debut in the Dear Boss expansion for Letters from Whitechapel, and each allows you to tweak the balance of the game between Jack and the police. If Jack’s victories are coming too easily, you may introduce the Policemen cards, which give each Policeman player a unique special ability. 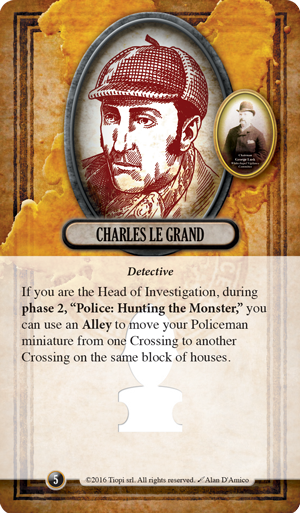 For instance, while Charles Le Grand is the Head of Investigation, you may use an alley to move your policeman from one crossing to another crossing on the same block of houses—giving you an unparalleled chance to catch up to Jack or head off his escape. Alternatively, Jack may be randomly assigned one of the twenty-five Jack Suspect cards. This card is kept secret and forces Jack to adapt his hideout and targets to the sectors shown on his card. Jack’s assigned role may be Joseph Barnett, for example. Not only does this determine the sectors of the board where Jack can place his hideout and make his kills during the first and fourth nights, it also forces him to use an Alley as his first movement during the first night. As the Jack player, freedom and unpredictability are your greatest advantages, so anything that prevents you from acting how you choose can be a significant disadvantage. On the other hand, perhaps your police are easily dragging Jack into a jail cell, and you want a little more mystery and terror to descend on the streets of Whitechapel. If that’s the case, you can certainly introduce the Potential Victim cards. Whenever one of the Wretched is targeted, Jack may trigger the nearest Potential Victim card, giving him a distinct advantage at the very beginning of the chase. Mary Ann Nichols, for instance, immediately gives Jack some more time by moving the Time of the Crime to the very beginning of its track. As you return once more to the dirty streets and filthy corners of Whitechapel district, you’ll notice again that the Dear Boss expansion is filled with the same historical detail that drew you into the terrifying events of the base game. 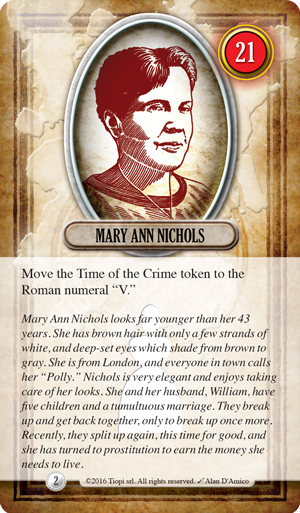 Every card in this expansion is filled with lines of history, giving you significant insight into the lives of the policemen, suspects, and victims who defined these nineteenth century tragedies. 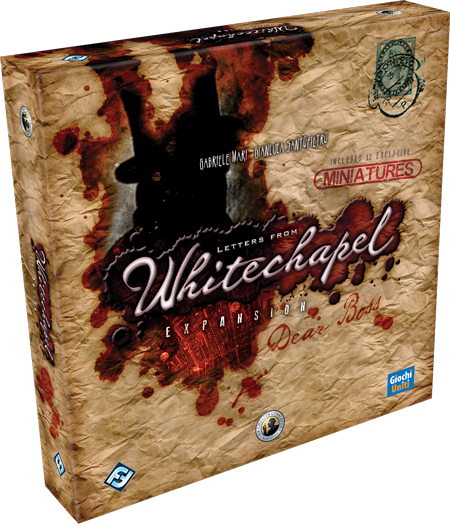 What’s more, twelve beautifully sculpted miniatures for Jack, the Policemen, and the Wretched invite you to experience the terror and mystery of Whitechapel more keenly than ever before. The killer stalks the streets of Whitechapel once more. Every stranger must be feared. Every letter could hold a sinister message of future violence. Will you join the police force and fight to catch this monstrous murderer? Or will you play as Jack himself, vanishing into the night after his dark deeds are done? Transport your games of cat-and-mouse back to Whitechapel district with the Dear Boss expansion for Letters from Whitechapel! Look for Dear Boss at your local retailer in the fourth quarter of 2016.
Letters from Whitechapel is the thematically engrossing board game of deduction in which one player takes the role of the infamous Jack the Ripper, while up to five other players are detectives pursuing him through Victorian London. After committing his horrible murders, Jack must outmaneuver the detectives in the tangled streets of the Whitechapel District. Meanwhile, the detectives must use clever deduction and their superior numbers to hunt Jack the Ripper down before he can kill again or elude them forever.